Honda Motor Europe today releases five short films that illustrate what happens when a truly innovative engineering project is interpreted through the eyes of artists working across a wide range of different genres. Now reaching dealerships across Europe, Honda’s X-ADV is the first vehicle to combine the comfort and convenience of a scooter with the spirit and dynamic performance of an adventure motorcycle. Appropriately for this latest example of Honda’s long tradition of innovation, a new promotional approach has been taken to bring the X-ADV to the attention of a wider audience. 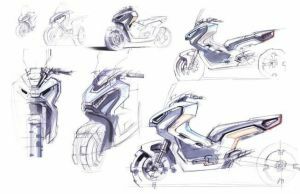 Based on a briefing by Daniele Lucchesi and Maurizio Carbonara – the two engineers who initiated and led the project at Honda’s Rome R&D centre – five artists from across Europe were given the task of expressing the world of the X-ADV in their chosen medium. The results – and Daniele and Maurizio’s explanation of the genesis of the X-ADV – can be seen here: honda.co.uk/artofadventure.